Jersey Shore Restaurant Week (JSRW), where to go, where to go? For those of you not familiar with Jersey Shore Restaurant Week, they have it fall and spring. This past fall event was cancelled due to Sandy’s arrival. Living in Monmouth County, so hard hit by Sandy, I’m always trying to help our local businesses and Restore the Shore. As a writer for Small Chick, Big Deals, I just HAVE to love the offers of $20.13 and $30.13 for 3 course lunches and dinners and the fact that many restaurants and/or chefs choose this time to ‘show off’ a little something special. 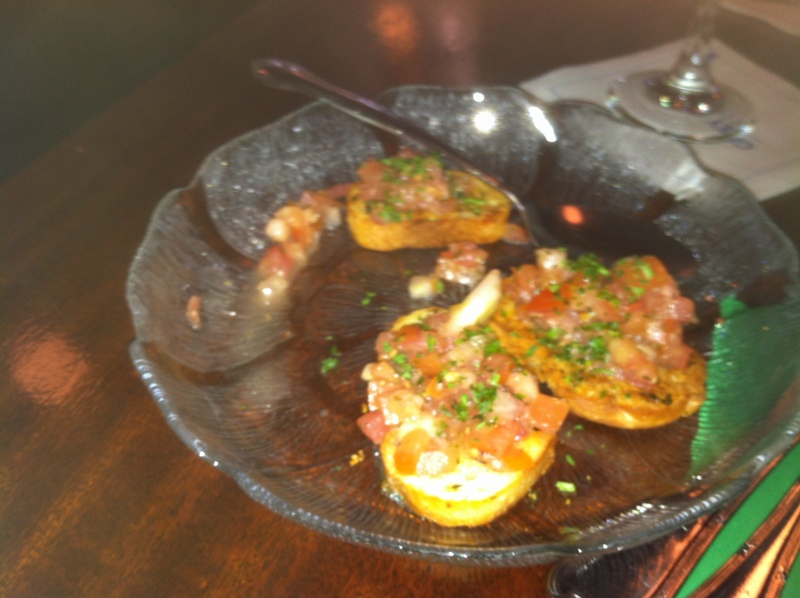 Our first choice this year was Fratello’s, 810 The Plaza, Sea Girt, NJ. Since it was JSRW we knew it was a good idea to go early. On a Sunday we got there about 5:45 and there were already 2 tables filled in the front dining/bar area. There is also a back dining room, but I like to see the bartenders in action. We were greeted at the door by a hostess who gave us a choice of seating. We chose a booth on the side. The busboy came and poured water in small goblets and the waitress came shortly after and asked if we wanted something else to drink aside from the water. I asked about their house white wines and she was very knowledgeable. She went through every house white and a little description. I knew then we were in for a fine evening. I chose a Pinot and my companion chose an unsweetened iced tea. She also asked if we were familiar with JSRW, as there is a separate menu. We said we were and had chosen Fratello’s because of its larger selection than many of the other JSRW restaurants. She smiled and agreed. While she went to get our drinks, the bus boy appeared and gave us a plate of brushetta. It was yummy, not over garlicky so it set the tone for the food to come. Shortly after, the busboy stopped by again with warm Italian bread and butter, in a covered basket. We ordered our appetizers and entrée at the same time. The waitress said she would ask us for our dessert choices later. (Some JSRW venues ask for your entire meal choices at once). Our appetizers were shrimp angels, which were butterflied shrimp covered with angel hair pasta and a very complementary horseradish and dill sauce, was that cognac in there? 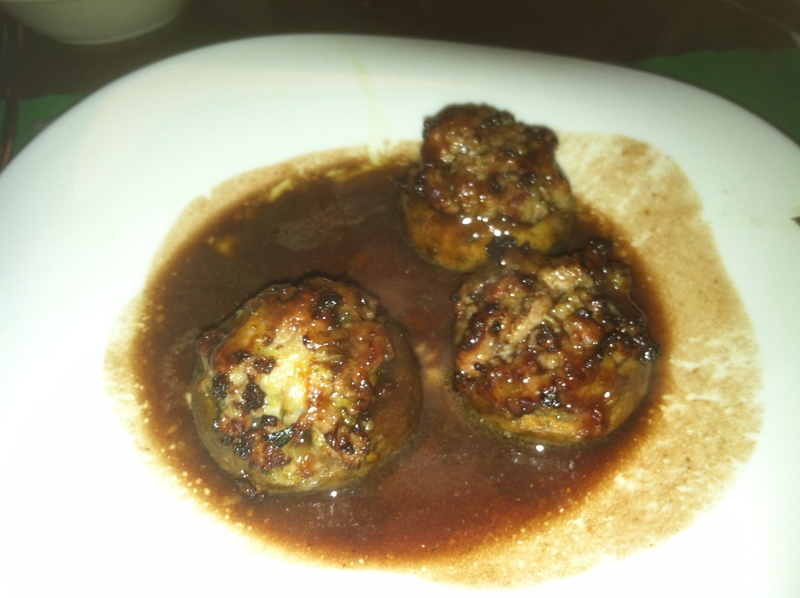 The other appetizer was mushrooms stuffed with sausage and fontina cheese and a hearty brown sauce. It is clear they know what they are doing in this kitchen! In between appetizer and entrée we were asked if we wanted another drink. My companion asked for a 2nd unsweetened iced tea. We were surprised to a charge for refills on our bill. Not many places charge for that today. Our appetizers were cleared and our entrees arrived. 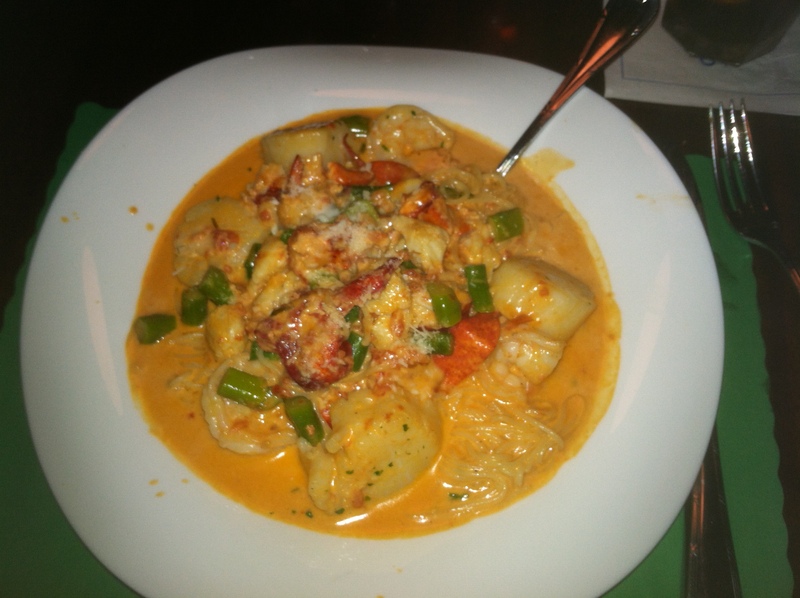 My companion ordered the Seafood Della Casa. And man, they were not kidding about that fish. Shrimp, scallops and what seemed like unending pieces of lobster. All this served with angel hair pasta and asparagus in another delicious sauce. I had ordered something a little out of my usual choices. 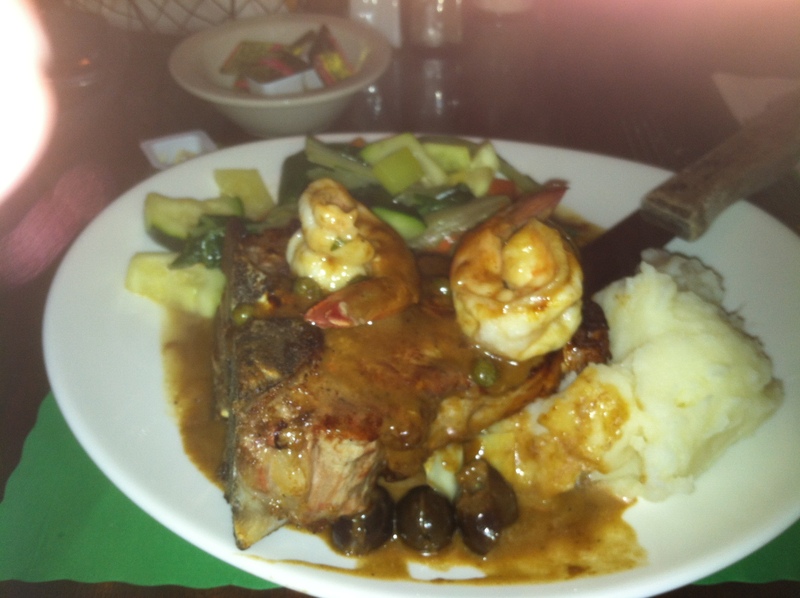 It was a veal chop and shrimp dish called Veal Chop and Shrimp Scapreciatta. I was just amazed that a veal chop could be as tender as a veal scallop. And let me tell you it was huge, this was a no skimpy chop and again, rich brown gravy covered it. The shrimp were tender and seasoned well and it was accompanied by seasonal veggies, carrots, zucchini and mashed potatoes. What a wonderful meal! Of course, since it’s JSRW there is a dessert to be had. My companion picked the apple cobbler and I chose the chocolate chip cheesecake. Both of these were apparently made on premises. 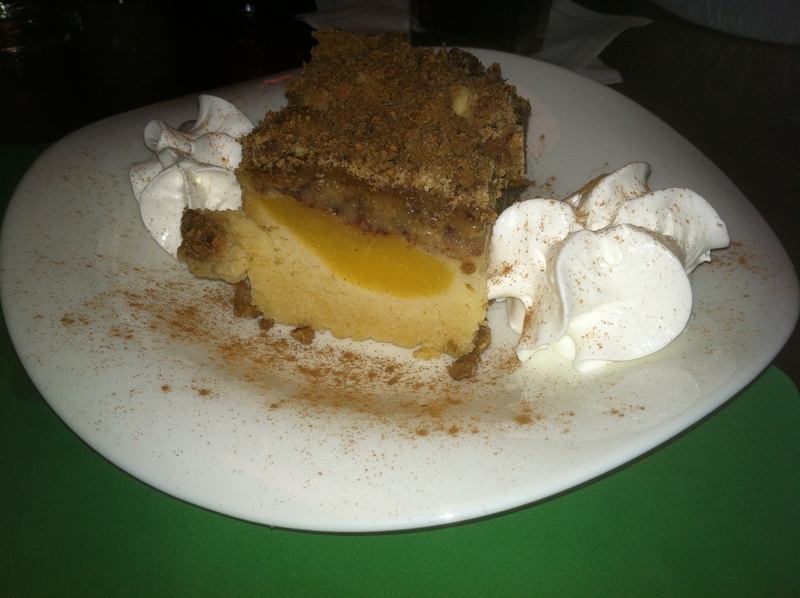 The apple cobbler came warm and was more of an apple cake with a crumb topping. It got a very positive reception from my companion. 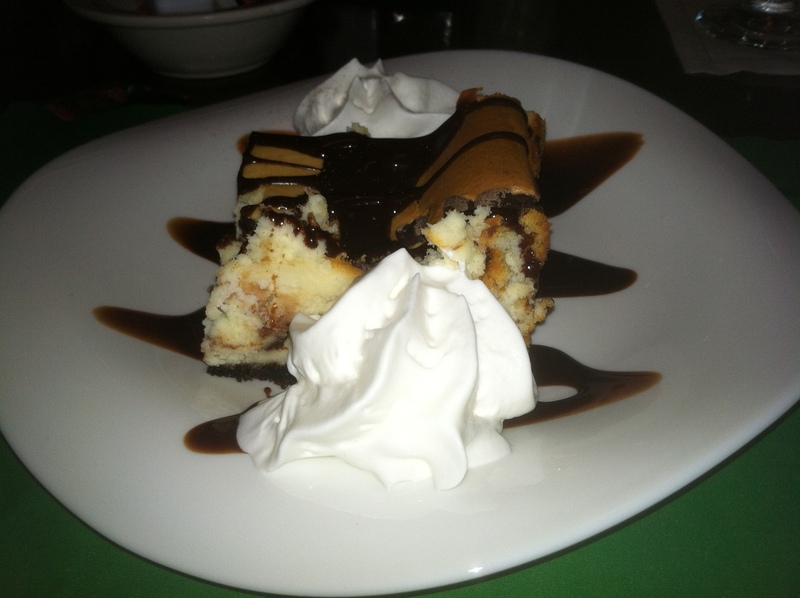 And I have to say, my chocolate chip cheesecake had to be one of the best cheesecakes I’ve eaten. It came with chocolate syrup and just enough whipped cream. While there are so many choices during restaurant week, we just might go back to Fratello’s once more before it’s over. This entry was posted in #DealAlert, Arlene Grossman Gaona, deals, Dining NJ, Jersey Shore, SCBD, Small Chick Big Deals and tagged arlene grossman gaona, fratellos, jersey shore, jersey shore restaurant week, monmouth county, nj, scbd, sea girt, small chick big deals by mamagaona. Bookmark the permalink.